Summary (from Goodreads): Joy, Tali, Luce, and Zoe were once best friends. Now they barely speak. That is, until the fateful flash of a photo-booth camera transports them back in time, to the summer they were fifteen—the summer everything changed. Photos fade. Friendships dissolve. Summers end. But this one will change the girls forever . . . again. My Summary: Joy, Tali, Luce, and Zoe are the kinds of friends that come from years of secrets told in the dark and months spent together away from the rest of the world. the four have been best friends since they were young, meeting for the first time at a nearby summer camp. After their last summer at camp, the girls promised to remain friends forever. Forever turned out to be a lot shorter than any of them expected. The reason? Joy - the "glue" that held the group together - disappeared, leaving behind no indication that she ever wanted to speak to her friends ever again. But now, two years later, Joy is back and making a single request: that all four girls meet at the camp one last time to say goodbye. None of them could have predicted what happened next, or the way it would change them forever. My Thoughts: So many people were pushing this novel on me that I had no choice but to give in and read it, and I'm a little angry with myself for waiting as long as I did. First off, this was the perfect novel to close out the summer with. It had everything you could possibly want from a summertime contemporary YA and then some - beautiful, lyrical writing; intricately woven plot lines and heartwarming moments of friendship, love, and loss. Joy, Tali, Luce, and Zoe were amazingly complex characters and each felt extremely real and dynamic - something that is usually a bit harder to pull off with multiple shifting points of view. Hillyer manages to make each girl feel like someone you've known for years, getting you inside her head and sympathizing with her before you even know what's happening. I loved the strength of the characters, and the exploration of what Zoe thought she knew about herself. My heart broke for Joy and the rest of the girls as they tried to figure out why they had drifted apart so easily, and why "forever" was a lot shorter than they thought it would be. I really liked that although each individual character had her own slew of problems to deal with, they all found time to offer strength and support to the others as they struggled with their issues. The time-travel aspect was also a really fun element of the story, although I kind of wish we got more explanation as to how/why it occurred. For some reason, I can't help but picture this novel as a movie - something like a cross between The Sisterhood of the Travelling Pants and Camp Rock (and yes, I know the former is a book as well. Sheesh, come on guys!). Final Thoughts: I recommend this novel to fans of Sarah Dessen, and those looking for a heartwarming read to finish off the summer with. 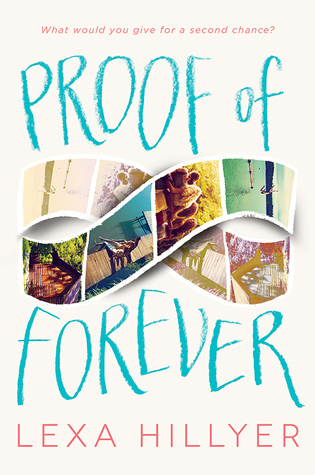 I thought that the Proof of Forever was just okay. I really would have loved it if it had focused more on the friendship with a bit of romance thrown in as opposed to a romance novel with a bit of friendship within it. I still think it deserves a read and I liked it enough to check out the author's future novels. The cover is better if they use the drawing instead of the film picture. Because you say it as the warm story, I will certainly read this book.